For some added traditional style in your bathroom, choose this beautiful vanity. It comes with a double-door cabinet and drawers for even more room to keep items. Make your bathroom look like new with this good-looking, useful set from Wyndham Collection. Enjoy the popular classic look in your bathroom with this beautiful vanity. This piece comes with a beautiful brown solid wood base and a brown granite counter. Keep many bathroom items in its roomy drawers and double-door cabinet. This simple vanity set from Wyndham Collection will fit right into any bathroom decor. Designed with a modern style and strong build, this vanity is a perfect choice for any bathroom. Made with a roomy double-door cabinet and drawers, this vanity has lots of room to keep items like toothpaste, towels, and hair brushes. Put together your perfect bathroom with this stylish vanity set from Wyndham Collection. Acclaim 48-inch W 8-Drawer 2-Door Vanity in Brown For some added traditional style in your bathroom, choose this beautiful vanity. It comes with a double-door cabinet and drawers for even more room to keep items. Make your bathroom look like new with this good-looking, useful set from Wyndham Collection. 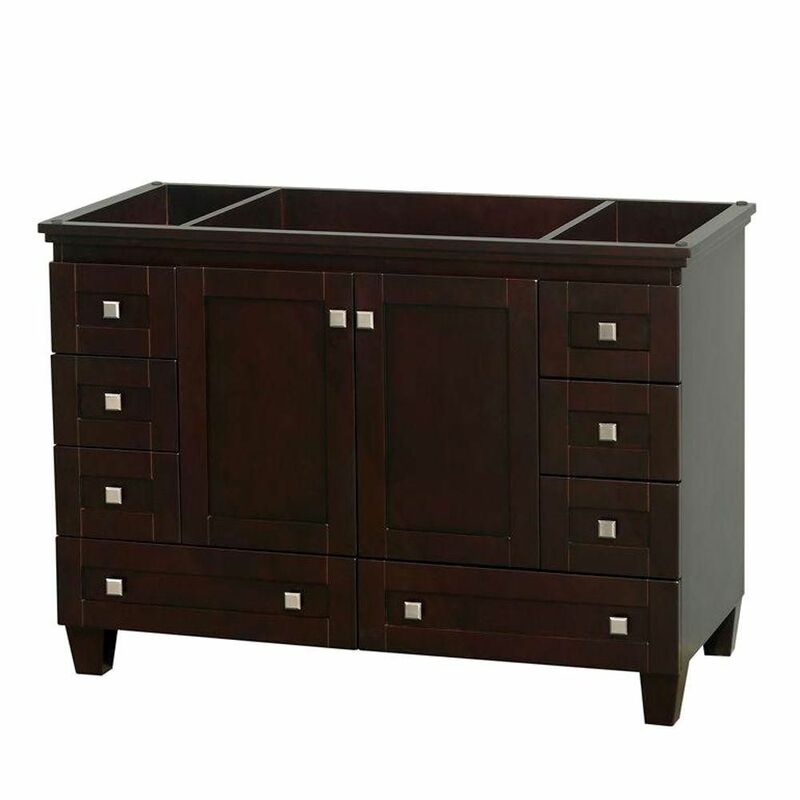 Acclaim 48-inch W 8-Drawer 2-Door Vanity in Brown is rated 4.5 out of 5 by 8. Rated 4 out of 5 by Kathy from This vanity is very solid and well made, looks like a piece of furniture not a cabinet. The color... This vanity is very solid and well made, looks like a piece of furniture not a cabinet. The color is a rich dark brown. I replaced the knobs because I wanted to have brushed nickel to match my faucet. Also the knobs are square which doesn’t make for a soft pull, and especially since the drawers are a bit difficult to open, the sharp corners of the square knobs were not comfortable to use. I'm much happier with a round pull. I'm hoping the drawers do become easier to pull open. I do like that they are soft closing. I was surprised at how much I could fit inside the vanity. The storage is definitely a plus for this vanity. The finish is a very smooth finish and seems to pick up dust easily, and because the vanity is dark, dust is seen easily. I put a white marble top on the counter. Looks great with the dark brown. Overall, a great value for the money. Rated 5 out of 5 by Ancsa from This is a very beautiful, well made vanity! It is very heavy since its all wood. This is a very beautiful, well made vanity! It is very heavy since its all wood. Rated 5 out of 5 by Donald from Easy install albeit this thing was very heavy which also... Easy install albeit this thing was very heavy which also translates into great quality. Design is really nice overall. Hardware perhaps a little lackluster but could easily be replaced and the finish is not spectacular. Overall though, for what was out there this unit is awesome. Rated 5 out of 5 by Chris from Beautiful vanity, and amazingly well-built. Drawers and doors close smooth... Beautiful vanity, and amazingly well-built. Drawers and doors close smooth with soft-close. The finish is well done and it comes in a sturdy box so there wasn't any chance of damage in shipping. We shall be going to Wyndham for future bathroom reno's. Rated 5 out of 5 by Lreed from Beautiful vanity!... Beautiful vanity!